Once Ballard passed on, the new Maple Leaf regime and particularly Cliff Fletcher looked to repair old wounds with many former players, including Keon. Although the relationship has never been fully repaired with the stubborn Keon, there has been a modest thaw in the cold war. Hopefully one day Keon will be able to return to Toronto and perhaps participate in some sort of thank you ceremony that Keon deserves, and the fans desire. Dave Keon could be a dazzling offensive player, utilizing bursts of speed and deft moves around the net. He also had what is widely considered to be one of the best backhands in the game, a deceptive, often powerful shot that flummoxed opposing goaltenders. He used his agility to avoid opponents' hits and remained injury-free for much of his career. He also used his speed and maneuverability as a pesky penalty killer, covering a large portion of the ice and turning shorthanded situations into scoring chances for his own team. He set a league record for most goals while killing penalties with eight in the 1970-71 season, a remarkable total since the most any Toronto team had managed up to that year had been 14. Had it not been for his mother, Toronto fans would never have had the chance to make Keon one of their all-time favorites. As a teenager in Noranda, Quebec, Keon was heavily courted by the Detroit Red Wings. His mother, however, objected to his moving so far away. He stayed in Noranda for another winter and was soon noticed by the Maple Leafs. The next year he went to St. Michael's College, as so many Leaf prospects did, and began to improve remarkably quickly. The Leafs informed him that he would be given a chance in the pro league in 1960, when he'd be 19. He was told by Bob Goldham and Father David Bauer, the St. Michael's coaches, that he could either learn how to play the defensive game - the game without the puck - in the summer or he could spend the next year in the minors working on it. He put in the extra time and effort and made the Leafs that Fall. Keon won the Calder Trophy as the top rookie that year and was a Second Team All-Star the next. Along with Red Kelly and Bob Pulford, Keon provided the Maple Leafs with a solid stable of centers, a nucleus of talent that would play a large role in the Leafs' four Stanley Cup triumphs in the 1960s. Keon was the playoff MVP in 1967, the last year the Maple Leafs won the Stanley Cup. Also in that span, he won the Lady Byng Trophy twice, in 1962 and 1963, as the NHL's most gentlemanly player. He had only two minutes in penalties each season, a remarkable total for such an effective forechecker and defensive player. At one time, Keon was the Maple Leafs' all-time leading scorer, overtaking Frank Mahovlich and George Armstrong, who had shared the record with 296 goals apiece. Keon seemed to be always at odds with Toronto management when it came to contract negotiations but was able to smooth over differences before they interfered with his play. In 1972 the Ottawa Nationals of the World Hockey Association announced that they were going to do everything in their power to sign the productive center. Keon was trying out at the time for Team Canada, hoping for an opportunity to play against the Soviets in the Summit Series. He was kept off that team because of the possibility that he might leave the NHL. He was later convinced to remain with the Leafs by vice-president King Clancy and signed the richest contract the team had ever offered, but he did regret not playing in the 1972 series with teammates Paul Henderson and Ron Ellis. Keon's leadership and productivity over his 15 years with the Leafs were all forgotten in the summer of 1975, at least by Harold Ballard, the cantankerous and headstrong owner of the team. He began to complain publicly about the lack of leadership Keon had shown to his younger teammates. Since Ballard was determined to rebuild the team with youth, Keon, the Leaf captain at the time, wasn't resigned. It was insult on top of injury and Keon, though a classy individual on the ice and off, has refused for years to have much to do with the team he was - and is - so strongly identified with. He signed as a free agent with the Minnesota Fighting Saints and spent four years in the WHA with the Fighting Saints, Indianapolis Racers and New England Whalers. In 1979-80, he returned to the NHL with the Hartford Whalers. Very quietly, in the summer of 1982, Keon ended his 22-year professional career. There was no fanfare. Keon, at the time the NHL's oldest player at 42, informed Hartford director of hockey operations Larry Pleau of his decision and then declined to have a press conference, saying he'd like to end his career without formality. Center, Shoots Left, 5' 9", 165 lbs. Born: Noranda, Quebec - March 22, 1940. Ask Dave Keon what a penalty box is and he might have a tough time telling you. Sound strange? If you have followed the centerman's career then you know that the diminutive Keon, he stood only 5'9" and weighed a paltry 165 pounds, was not just a great hockey player, but he was one of the game's cleanest and most gentlemanly players. In fact, in 1597 combined NHL and WHA regular season contests, Keon only accumulated 137 minutes of penalties and six times he played an entire season with totaling only two penalty minutes. After a year of "B" hockey, Keon played three full seasons and a smattering of a fourth for the St. Michael's Majors of the Ontario Hockey Association. It was with the Majors, a team that was always scouted thoroughly by the NHL's Toronto Maple Leafs, that Keon found his niche in the game. While showing promise as a goal scorer and playmaker, Keon was never the strongest or biggest player on the ice. Keon worked on developing his skating, puck handling, and checking skills and would soon develop into one of the NHL's best defensive forwards. When Keon finally earned a spot on the Maple Leafs in the 1960-61 season, the forward posted an impressive 20 goals and 25 assists over the course of 70 games en route to winning the Calder Trophy as the league's standout rookie. Most impressive though about his rookie season was his ability to play at such a high level while only posting six penalty minutes for the year. Avoiding the penalty box would become a regular occurrence throughout Keon's career. The only way Keon could have topped his rookie season was to win the Stanley Cup. And indeed he and his Maple Leafs not only won the Cup during Keon's sophomore season, but also in the next two years to follow. Keon had established himself during this three-year "championship" period as a legitimate 20-goal and 60-point player. During the 1961-62 campaign, Keon played in 64 contests and managed to accumulate a scant two minutes of penalties. Keon repeated the feat the following season, this time participating in 68 games. It is no surprise that Keon won the Lady Byng Trophy for gentlemanly play at a high skill level during both of those seasons. 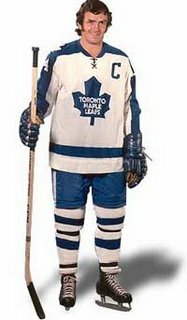 Keon would help lead his Toronto Maple Leafs to a fourth Stanley Cup championship during the 1966-67 season. Keon, a 52-point scorer during the regular season, managed just three goals and five assists during the postseason, but his excellent defensive play and penalty killing earned him the Conn Smythe Trophy as the postseason's most valuable player. Many who remember that Maple Leafs-Canadiens finals cite Keon, who notched just a goal and assist in the series, as being the reason why Toronto was able to secure the Cup that year. Keon played with the Maple Leafs through the 1974-75 campaign, but while he maintained a high level of play, Toronto suffered through a couple of lean years. Still, Keon reached his highest goal scoring totals of his career, notching at least 32 goals on three separate occasions including a 38-goal outburst in the 1970-71 season. Keon's 38-goal season came just one year after succeeding George Armstrong as Captain of the Maple Leafs. Keon played 15 seasons with the Toronto Maple Leafs but then jumped to the upstart World Hockey Association. Keon spent time with the Minnesota Fighting Saints and the Indianapolis Racers before finding a home in Hartford with the New England Whalers. As a Whaler, Keon twice won the Paul Daneau Trophy, which was the WHA's equivalent of the Lady Byng Trophy. When the WHA ceased operations, Keon remained with the Whalers when they joined the NHL in the 1979-80 season and played his last three seasons as a professional in Hartford. Keon certainly enjoyed a professional career that any player could look back on and be proud of. In 1296 NHL regular season contests, Keon notched 396 goals and amassed 590 assists. It was no surprise to anyone that Dave Keon was enshrined in the Hockey Hall of Fame in 1986. KEON MISSES OUT ON FOUR MORE CUPS !! In 1980, the New York Islanders sought to sign Keon as the final piece of their soon-to-be dynasty. But Toronto still owned Keon's NHL rights and Ballard again killed the deal. The Islanders acquired Butch Goring instead, won four Cups in a row, and Keon finished his career in relative obscurity in the WHA and for three seasons with the Hartford Whalers after the merger. Of course, bitter departures are par for the course for Leafs captains. Not only did Ballard offer Keon an insulting contract, but he also blocked Keon from joining another NHL team. With nowhere else to go, Keon went to the rogue WHA ... but his feud with Ballard persisted. Sports fans love to reminisce over the days where it all went wrong: the wasted draft pick, the tragic trade or the defecting hero. These may not be, by definition, the worst roster moves ever made, but they were the ones that affected us on a personal level. These are the events that caused -- and still cause -- us to sit on our bar stools and lament the cruel twists of life. No other fans weave themselves into the tapestry of their team like Maple Leafs fans , who regard these players as sons, nephews, brothers. They wrote in about the ugly Harold Ballard days, which saw the trades of fan favorites like Dave Keon, Lanny McDonald, Darryl Sittler, and Russ Courtnall; not to mention non-Ballard dispatching of Frank Mahovlich in 1968 and Wendel Clark in 1994. Starting with the Calder Trophy as the rookie of the year in 1961, Dave Keon went on to win two Lady Byngs and four Stanley Cups, including a Conn Smythe performance in Toronto's last title in 1967. He also captained the team from 1969 until his bitter departure in 1975. In 1975 Maple Leafs owner Harold Ballard permitted one of the finest players in franchise history, Dave Keon, to leave the team by refusing to pay him a fair wage. Keon's contribution to the team and game over the previous 15 years was substantial. Keon had earned much respect and should have been rewarded by the Leafs. Keon moved on to the Minnesota Fighting Saints of the WHA, and he played many more years of productive hockey which culminated in his election into the Hockey Hall of Fame. In the minds of many, Keon is the best player ever to wear the Maple Leaf. An entire generation of Leafs fans is aching to tell him that in some sort of ceremonial way. It would have been perfect at the closing of Maple Leaf Gardens last year. Or the opening of the Air Canada Centre. Or as part of the NHL all-star game festivities on Feb. 6. A quarter century has gone by since Keon's messy breakup with the Leafs and their cantankerous owner, Harold Ballard. If ever a player deserved to wear a Maple Leaf on his chest from start to finish of his career, it was Keon, the Conn Smythe Trophy winner when Toronto won the Stanley Cup in 1967. But when the World Hockey Association came calling, Ballard would not respond to the challenge and his final link to the glory days of the 1960s left town. "I had a business deal with the Leafs that didn't work out so I had to go and work someplace else," Keon said. "Which I did. I had to move on with my life." Ballard is long gone. Most of Keon's old teammates, shunned during that distasteful era in Leafs history, have made their peace with the organization. But not Keon. Help Dave Keon and his fans make peace HERE! !